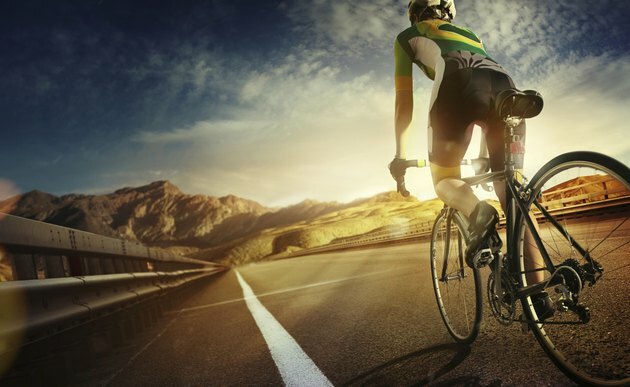 Competitive cyclists will use their VO2 max as a benchmark to gauge their endurance capacity as well as incorporate the data into a training program. VO2 max measures the amount of oxygen the body can absorb during intense and prolonged exercise. The higher your VO2 level, the better your cardiovascular fitness is. To calculate your cycling VO2 max, you will need a bicycle equipped with a power meter. Ride at a low intensity -- with a cadence of about 70 to 80 rpm -- for 10 minutes to loosen up your legs and to slightly elevate your breathing and heart rate. Next, complete two 30-second sprints at whatever gear lets you reach 100 bpm. Recover for three minutes between each sprint. Finish your warm-up with a five-minute easy spin. Rest five minutes before starting the field test. Pedal for 20 minutes at a maximum yet sustainable effort. Monitor your power meter to stay at a consistent intensity and gradually increase your wattage during the first three minutes until you feel you have reached a power output that you can maintain for the duration of the test. Aim for a wattage that is close to previous high-intensity rides or races. While level ground is ideal, hills can be used as long as you can maintain the intensity on the downhill portions. You may need multiple attempts at the field test in order to determine a steady pace that you can maintain for 20 minutes without easing up on the intensity before you complete the ride. Wait two or three days between tests to allow your body time to adequately recover. Once field testing is over, ride for 15 minutes at an easy pace as a warm-down. Multiply your average wattage from the field test by 10.8. Divide that number by your weight in kilograms. Add seven to that number to calculate your VO2 max. For example, if you averaged 300 watts during the field test and weighed 80 kg, your VO2 max would be 47.5 mL/(kg x min). On average, untrained athletes have a VO2 max of 36 to 72 mL (kg x min) for men and 26 to 42 for women. Trained men average 50 to 70 and trained women usually fall between 40 and 60. Elite athletes usually have a VO2 max over 60 for men and over 50 for women. For example, former champion cyclist Greg LeMond scored a VO2 max of 92.5 with the current record holder being Norwegian cyclist Oskar Svedsen with a score of 97.5. VO2 max testing is typically undertaken by athletes who are looking to enhance their riding performance by using the data to design their training program. You should have some experience riding and pedaling at high intensities for at least 20 minutes before attempting the field test. Consult your physician before undergoing the test.